Nowadays TV system is trending towards HD (High Definition) resolution. That is not all, almost every new electronics gadget are compliance with HD such as DVD player, Handycam and setop box. If you have few HDMI (High Definition Multimedia Interface) compliance devices and wish to connect it to a single HDTV, then this could be a good solution for you. 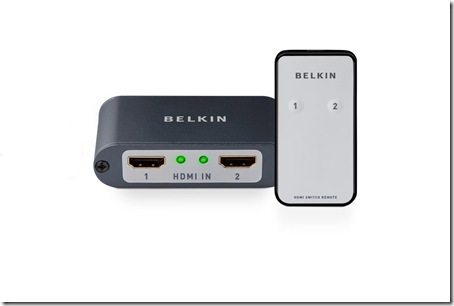 Belkin has just unveiled a new HDMI 2 to 1 Video switch for CE (Consumer Electronics) market. By using the HDMI video switch, the user is able to switch between two inputs of HDMI devices to single output that are connecting to the HDTV. With this in place, the cabling around your TV cabinet could be minimized and more importantly, the users don’t need to plug and unplug the video source and all these can be simplified with a single touch on the device. If you still think walking to the cabinet to switch the inputs is too much of work, you may consider using the IR remote control that comes with the package. The HDMI switch is compliance with all HDCP (High-bandwidth Digital Content Protection) devices in the market. And it is capable of handling different resolutions ranging from 480i/p, 720i/p and up to 1080i/p Full HD resolution. It will be available in commercial market by first quarter of 2008. At the price of $49.99, this is a good device that you can’t miss in your digital home.